There are good train connections between Kiev and most cities in Ukraine. Travelling by train is a great way to see the country and is more comfortable than taking a bus. Tickets are fairly cheap. At the time of writing (November 2012) a first class ticket on the 105 train from Kiev to Odessa cost 522 UAH when purchased 7 days in advance. A second class ticket cost 150 UAH and a third class 77 UAH. Not bad given these cities are over 300 miles apart. Trains arrive at, and depart from Kiev Train Station, next to Vokzalna Metro Station. Trains run between Kiev and most cities and large towns in Ukraine. 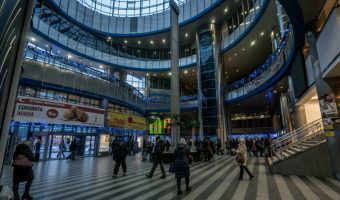 Popular choices include overnight trains to Odessa and the express day trains to Lviv (5 hours) Dnipropetrovsk (5 hours), and Kharkiv (4½ hours). For a full timetable of trains to and from Kiev go the timetables section of the Ukrzaliznytsia website (choose Kyiv-Pas from the ‘Timetable for Each Station’ drop-down menu). Travellers can book train tickets from various websites. Note that on successful completion of the booking process you may receive a voucher (not an e-ticket) with a payment number. It’s a voucher and not a ticket. It needs to be exchanged for a ticket at the train station for the actual ticket you’ll need to travel. Ukrzaliznytsia have an online booking facility where passengers can purchase tickets for train travel throughout Ukraine. Stations must be entered using the English translation of the destination name in Ukrainian (not Russian). For example Kyiv not Kiev, Odesa not Odessa, and Kharkiv not Kharkov etc. Train tickets can also be bought online from the Tickets.ua website. Tickets can be purchased in person from Kiev Train Station or the Central Ticket Office. The Central Ticket Office is a better bet as it’s both quieter and closer to the city centre. Many travel agencies also sell ticket but will charge extra for service. Station close to the city centre. Serves both Ukrainian and international destinations.